The KRI Nagapasa (403) of the TNI-AL. Photo c/o DSME. 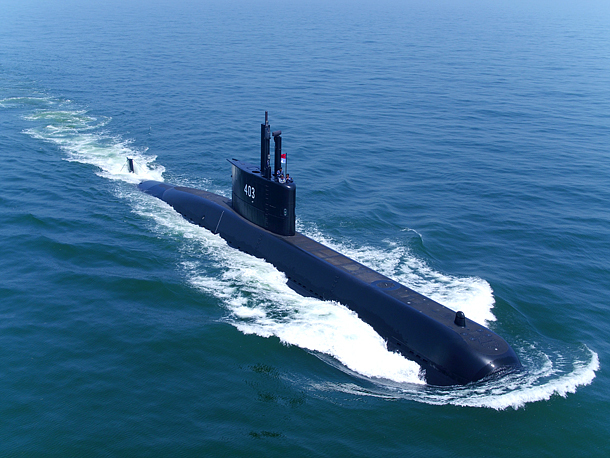 The Indonesian Ministry of Defence (MoD) signed a contract worth US$1.02 billion with South Korean shipbuilder Daewoo Shipbuilding & Marine Engineering (DSME) on 12 April 2019 for the purchase of three (3) brand new submarines for the Indonesian Navy (TNI-AL). The contract was signed in Bandung, Indonesia, and is a follow-on order to an earlier order of three (3) modified Type 209/1400 (Chang Bogo-class) submarines for the TNI-AL in 2011. Indonesian shipbuilder PT PAL is expected to take a bigger share on the construction of the submarines, after successfully taking part in the local assembly of the 3rd submarine ordered in 2011, which are now called the Nagapasa-class in TNI-AL service. For this new deal, it is expected that PT PAL will built 2 of the 6 modules of the 1st submarine, with the rest built by DSME in South Korea. PT PAL will then build 4 modules and the rest by DSME, while the 3rd submarine may be built completed by PT PAL. Indonesia previously indicated a need for more than 10 submarines to protect its waters and exclusive economic zones. Currently it has 2 older German-built Type 209/1300 submarines, and 2 new South Korean-built Nagapasa-class submarines, with the third one launched on 11 April 2019 and will be ready for service within the year.